Being from the Deep South, I have often heard it said that there are three sports seasons: College Football, Recruiting and Spring Football. The fact that many schools put 90,000 in the seats for their spring games, which are broadcast on ESPN, is proof that College Football is a year-round spectacle. Despite this, I cannot think of many things that would cause me to write about College Football in May. But this is something that should have died in January and it hasn’t. Central Florida beat Auburn and pretended they were National Champions, having a parade, rings, the whole nine yards. It was cute and similar to what other non-National Championship teams have done in the past (i.e., Auburn 2004). Usually, this sort of thing goes by the wayside in a few days. But to paraphrase a controversial slogan of the times, they persisted. In part, I blame social media. Somehow Twitter gives the illusion that we have access to celebrities and Facebook gives us a platform to sound off on everything to an ambiguous audience of hundreds of people. And via these extremely popular sites, Central Florida has clearly taken advantage of how no one seems to be able to ignore anything they disagree with. Similar to the “I’m not dignifying that with a response” being a response that dignifies, every time someone argued against Central Florida’s real claim to a fake national championship, they gave more and more momentum to their argument. Of course, that is what I’m doing. But only because Nick Saban of all people has now joined the fray. Nick Saban is the best college football coach, maybe ever. But he’s also a bit of a whiner. And as such he could not hold back last week on commenting on Central Florida’s National Championship claim, deriding it as only he should have. And I cannot deny that once he joined in, people like me can no longer ignore it. It’s time to weigh in. Here’s the dirty little secret about Auburn 2018: They were a fantastic team, but they lost four times away from home, including to LSU (who lost to Troy at home, if you are a big fan of A beats B beats C). They beat Georgia at home but got romped at a neutral site. Central Florida needs to let this paltry argument go1. So was Utah in 2008. So was Boise in 2006. And they didn’t get National Championships either. Why? Because their schedules were not difficult enough. It’s great that UCF could knock off Auburn in the Peach Bowl, but when you play in the SEC and similar conferences, you get teams like Auburn several times a year. I conceded it’s not fair that Central Florida’s players and coaches cannot control their schedule. But that’s part of sports. It’s not fair that Auburn in 2004 and Penn St. in 1994 got no championship despite running the table against a legit strength of schedule. It’s not fair that the players for Auburn in 1993 had nothing to do with the reason they were on probation and were the only undefeated team in the nation and got nothing. There is no doubt College Football has historically had the most convoluted method to naming a champion since the NCAA had never recognized one. If you look back through College Football annals, it is very hairy trying to figure out who gets credit for championships in what year because some schools claim them from non-AP poll and Coaches Poll sources (the two standard championships every year until the BCS). Additionally, teams used to be awarded championships before bowls were played. And is there anything more absurd to sports logic than having two (or more) national champions? But now we do not have to deal with that. 2014 changed everything. We have a fairer system, and even more precisely, we have a playoff. Even if Alabama’s 1973 Championship is shady (and I’m not arguing for or against it), you cannot apply standards or laws or any similar criteria to modern circumstances. It devalues advancements we have made. We need more teams in the playoff. Even if there were eight, I do not think Central Florida would have gotten in, but I have zero doubt the 8th best team in the nation most years can run through three other Top 8 teams in three weeks. I personally prefer 16. The NCAA tournament in basketball is not devalued at all despite the fact the bottom 32 teams or so have little to no chance to win it, so even if #16 has no chance to run the table, it still makes for more potentially great football. UCF is likely doing this in part to help with recruiting. I do not mind it in that sense. The problem is I have zero doubt reams of people are truly arguing that they deserve their rings, parade, etc. because they deserved a championship last year. Those people exist mostly because they are UCF fans or hate Alabama or the SEC or just love controversy, which our current political climate proves people are addicted to. The belief that UCF actually deserves a national championship is what I am arguing against. I love the Welch example! That is hilarious. Also, I agree with you completely. UCF had a great season but they played a relatively easy schedule. I would have liked to see them in a 16 team playoff so they could prove on the field that they deserve a championship. Too bad NCAA football is not there yet. I can’t think of anything that would make College Football more exciting than a team like UCF as a 12 seed going up against 5-seeded SEC/Big Ten school in the first round of a tournament. College Football is ridiculously behind in this way. This is fantastic stuff, especially the Welch-beats-Villanova graphic and the “Nick Saban is a bit of a whiner” confirmation. I’m like you; May really isn’t a time for football news, given that there are, you know, three other major sports in the pros and numerous college sports that are actually playing games right now, but this was worth the read. Thanks Marcus! Nick Saban goes beyond the “bit” part, but I don’t want Alabama fans missing the point of this article to argue it. Gowdy throwing out the haymakers! I don’t really believe that UCF is the National Champ, but I do think your first point is a bit of a stretch. UCF has one degree of separation whereas our beloved Welch has 11 degrees of separation. I understand the point you are trying to make but I don’t think your argument there is fair. Personally, I think the field should be expanded to 24 or even 32 teams to give mid major teams a chance. It is almost impossible these days for a good mid major program to improve its’ strength of schedule because the Alabamas, Penn States, Clemsons, etc all know that if they do lose to them then they have no chance of winning the National Championship. I think that problem could be solved by expanding the field because even with a loss a team like Bama would be top 24 or 32 but a loss to a team like UCF in the regular season would mean it would take a miracle to make top 4. Just my 2 cents. Yes, my point is exaggerated and if it were not Welch, I doubt I would have used it! LSU vs. Troy was my more serious example. But regardless, I agree with your post in general. One solution is that if you keep beating the big boys when you get a chance, you can eventually get invited to a big boy conference, as happened with Utah and TCU. I’m not sure why it has never happened with Boise. But I have a feeling the conference landscape is going to keep shifting slightly and UCF could get in on the big money conferences. For all I know their made up National Championship stuff is not just to help recruiting but to get a huge leg up on ohter mid-majors should we ever go to something like four 16 team super conferences. UCF has Nick Saban giving them attention. That is huge I think. If they were just a gnat he would have swatted them away. But by milking their Auburn win they have everyone talking. I can’t think of too many ways that hurts them. I don’t care what Saban says. I bet you a million dollars that he has been royally cheating at Alabama the last 10 years. His titles are fraudulent, more than likely. I think there is so much cheating going on in college athletics I can’t even try to guess it all. Those 30 for 30s have really helped people like me begin to grasp it. Point #2—UCF was the only undefeated team in the FBS last year. There is no argument against that fact. Did they play a tough schedule? No. But Saban making reference to how tough the SEC is somewhat laughable, too. How many SEC teams went undefeated outside of SEC play last year? only 4 (Bama, Vanderbilt, Tennessee, and Miss State). In fact, 6 SEC teams lost multiple games outside of conference play. That doesn’t sound like a dominant conference when roughly half of the teams are losing multiple games to teams not in their own conference. So UCF being undefeated is at least a bigger deal than SEC fanboys want to let on. Point #3—You are correct when you say the current system is “fairer” than past ones, even the BCS. But “fairer” to whom? No team outside the Power 5 conferences has been selected to the playoff yet. So there’s still half of D-1 teams with no chance at a national championship. “Fairer,” but not entirely fair. There’s no way for a team like UCF to contend for a national championship as of now in the NCAA. So what’s the harm in letting them claim one for a really good, undefeated season in which they beat the division winner from the SEC West? 1. I’m not sure you are arguing against my point. My only point is that A beats B beats C isn’t a way to decide who is better if you have a bunch of other information that is one sided. Saban spoke to it because he was asked and because UCF won’t shut up about it. 2. The SEC was not dominant but their conference is head and shoulders above UCF’s. There is no doubt about that. Georgia didn’t lose outside of the SEC. USC lost once – to #1 Clemson – and beat NC St and Michigan at neutral sites. The SEC had some terrible losses, but Saban’s point is salient. His schedule was much better. Besides, conference aside, they beat Clemson and Georgia back to back. UCF has nothing even close to that. An argument could be made that maybe Alabama should not have gotten. I would argue otherwise, but that at least is an argument. As to who played the tougher schedule…there is no doubt. 3. It’s more fair for everybody. You will never see dual champions on a College Football list from henceforth. That is the goal. No mid-major team had won a College Championship since 1984 (BYU) and that was before the present system (The team they beat in the bowl wasn’t even ranked). So I don’t think they are victims. They occasionally get up to play a big school in a bowl and win, often when the big team is coming off of a devasting loss, but they aren’t real threats. You need to move up and then complain. Utah and TCU did it the right way. The harm is in how they aren’t a national champion and they are saying they are. 1. It is valid because you have one team who didn’t lose to A, B, C, D, or anybody. 2. Agreed, Alabama played the tougher schedule. My point was that the majority of the SEC teams lost outside the conference, whereas UCF never lost in or out of conference. Going undefeated in D1 FBS is a big deal, no matter what conference you’re in. No one in the SEC can say they went undefeated. 3.It’s not more fair to half the FBS schools. You will never convince me of that. I agree that UCF went undefeated. That doesn’t undo my first point. The second point doesn’t really have anything to do with a national championship. Tulane, Marshall, Utah in 2004, etc. all did it vs. a D1 I-A schedule. None deserved championships. No one in the SEC went undefeated because they had to play the SEC schedule. Power 5 conferences are not Power 5 because they aren’t good enough to be. This is basic evolution. TCU and Utah moved up. That’s how to do it. Otherwise you would have to give the MAC champion similar treatment as the ACC Champion and that will never be fair to me. Point 1 matters when one of the teams never lost a game while the other one did. I agree the Team A beats Team B beats Team C logic doesn’t work as long as everyone lost to someone. But it is very effective for a team that never lost when the National champions did lose to a team that the undefeated team beat. Point 2 obviously means something to UCF. They went undefeated, unlike every other team in D1 FBS. They have a point, no matter how weak their schedule was by the conference tie-ins they have. And they beat the SEC West champion to remain undefeated. 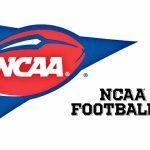 Point 3–Power 5 conferences are not Power 5 because they are good enough to be. This is observational science. The schools were either grandfathered in because of past conference ties, or the schools have money. This point is where I disagree with you in the fact that the current system is fair. 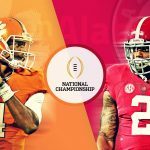 Why should a D1 FBS school feel the need to “move up” to have a shot at the national championship when they are already in the highest possible division in their system? Plus, it’s not up to them whether they have a shot to get into those Power 5’s anyway. It’s up to the schools with money, most of whom haven’t been relevant for 20+ years (which includes Virginia). Again, the current system is no fairer to half of the D1 FBS schools than any of the past systems. They have no say-so in anything, including getting into a new conference which they shouldn’t feel the need to attempt to get into. Personally, I would love to see the playoffs expanded to 8 teams—each Power 5 conference champion, the highest ranked (or any undefeateds) from the other conferences, and however many at larges to make up the difference. At least that way, everyone truly has a shot. If your went with a 16 team playoff, I think you would need to do every conference champion, and 5 at larges. Also, is it really so wrong for UCF to claim a mythical national championship? Does it go down in the record books as such? No. If that hurts Alabama’s feelings, then so what. Or if it sounds insane to Nick Saban (and everyone else not affiliated with UCF), then so what. Saban speaking to it shows his lack of self-control and maybe some personal insecurities on his part (maybe that he couldn’t make it as a head coach at the ultimate level, the NFL). Regardless, I think Saban should have left it alone. It seems more petty on his part to denounce UCF’s national championship claims than it was for UCF to make the claim to begin with. Even by Gowdy’s own logic, UCF still has plenty to prove. So their claim to a NC is a way for them to show they don’t have as much to prove as others may think. Saban has absolutely nothing to prove, other than the fact that he is an insecure, arrogant jerk. 1. Being undefeated or not doesn’t matter to my point. 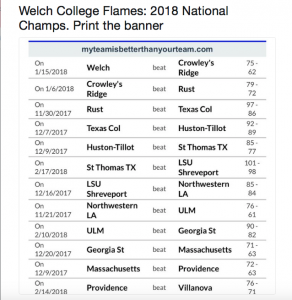 Had Welch College gone undefeated, it would not change my point at all. 2. All of those things other teams have done. None of them won National Championships. They may have argued it for a few days, but not a few months. Most (All?) didn’t have parades, rings, etc. 3. Power 5 conferences are the way they are because of how good/bad they are. The former Big East lost their standing because the schools aren’t good enough. Utah and TCU moved up because they were good enough. 1. I think for the argument’s sake, going undefeated does matter for this point. No College basketball team went undefeated in D1 last year. In fact, every team had multiple losses. That was not the case in D1FBS football. It does matter to UCF’s claim. 2. I think those other teams should have claimed national championships, so something more drastic could have been done sooner. As it is, we are a couple decades later with nothing better to offer. That doesn’t dismiss UCF’s personal claim to a NC after an undefeated season in which they beat the SEC West champ. 3. I love how you Re-worded it to fit your point. I am talking about the individual teams that make up the power five conferences. Most of the individual schools were grandfathered in, or have money. Those are the only reasons why they are a part of one of the power 5 conferences. Because they haven’t done diddly squat on the field to prove they belong there. Again, teams shouldn’t feel they have to “move up” when they are already D1FBS schools. Why not just make two more subdivisions called “national contenders” and “national pretenders?” It doesn’t make sense for half of the teams to not have a shot at all, and it’s out of their hands even to move up. Because it’s the Nick Saban’s of the world who would have to deem them worthy enough to move up. It’s not fair, no matter how much you want to say it is. It’s easy for Vanderbilt and Virginia to ride the coat tails of the Alabama’s, Florida’s, FSU’s, and Clemson’s every year and look down on 60 other teams who are probably just as good as they are who won’t have any say-so or shot. It doesn’t matter for the point. If A beats B beats C, do you think A can claim superiority over C automatically? No, you can’t. The fact there is NO ONE of any any importance claiming titles for any of those schools proves my point. CFU is taking advantage of social media. I’m not rewording anything. If you are a good team, you move up. If you are bad, you move down. Vanderbilt, UVa, etc do not matter to my point. If they go undefeated they will get a chance to play in the playoff because they have played the tough schedule. Don’t you think it would be better and completely unquestioned if every team in D1 FBS had at least an outside shot at winning the national championship every year? That’s UCF’s beef. Half of D1 FBS teams haven’t even had a shot in any particular year so far. I’m not talking about mythical invitations to join mythical superconferences or even mythical invitations to join existing power 5 conferences. Those are just as mythical to this point as UCF’s claim to a NC. So therefore, not everyone in the same division has a chance. The teams with money and grandfathered tie-ins have all the say and all the opportunity in the same division. Therefore, UCF takes it into their own hands to claim themselves NC opposed to the boys with all the clout. I don’t see the big deal? It doesn’t mean anything, unless you’re insecure. As I said in the article, I didn’t take it seriously until Saban said something. I doubt the man with 5 National Championships in 9 seasons is that insecure. I think he’s very socially intelligent and knows he has power to squash this bug that is hanging on for dear life but won’t die. My examples are real world and not mythical. I’ve cited things that happened. Utah and TCU were not grandfathered in. Many schools have moved up from I-AA to I-A this century for being successful. No it doesn’t go down in the record books but they are trying to change public perception. Which can happen. Barry Bonds in is the books for the all time HR record, but public perception taints it (as it should in that case – in the case of UCF it shouldn’t). I don’t care that much for Saban but I think this matters to the integrity of College Football, so I wrote about it. Mind you, I do not think the integrity of CF is that important compared to other things but we here at REO love writing about our vices as well as theology. What’s wrong with trying to change public perception, especially if it gives more people a fair shot? You and Nick Saban would have made incredible papalists in the 15th/16th centuries opposing Nartin Luther, or Tories in the 18th century. I care about truth. That’s all. It’s not fair to say UCF won a championship. Or true. Nothing that happened 500 years ago matter to that. It’s not true. I agree with that statement. But “fair”…Fair to whom? That’s a different argument. I think it’s fair for UCF to claim themselves national champions according to their own criteria and unblemished record. Alabama and Nick Saban shouldn’t feel so insecure about that untrue, but personally fair assessment UCF has made of itself. UCF has every right to think they were the best team in the nation last year. If they want to spend extra money for NC rings and a trophy, let them. What’s that to Alabama? UCF isn’t claiming to be the college football playoff champion. They’re using different criteria. I think what they’re doing might actually get things to change eventually. I hope whoever goes undefeated outside the power 5 next year does the same thing. 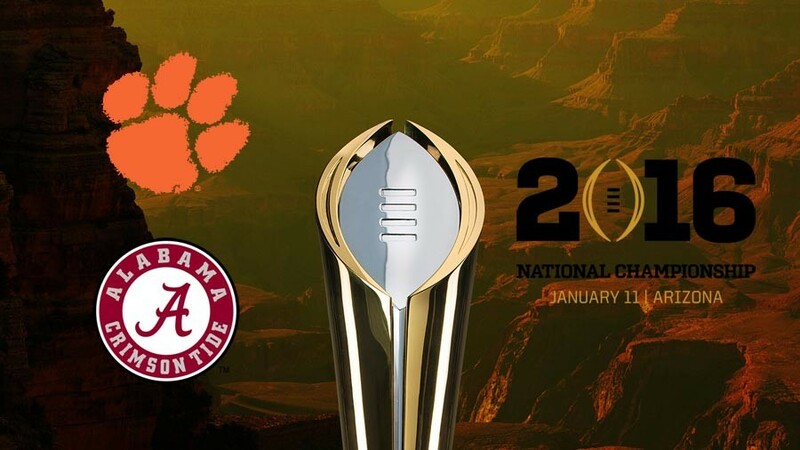 “College Football Playoff Champion” in the National Champion. There is no other criteria. That’s the whole point of the article. Exactly! Why then does Nick Saban feel the need to speak to UCF’s claim? He is being pathetic, more so than they are for claiming themselves NC. UCF is speaking in order to attempt to stir the pot and speak up for the “little guys” who are in the same D1 subdivision as those schools with all the power and all the chances at national championships, because it’s not even remotely fair for half of the teams. In fact, it is impossible for half the teams to win a national championship. The P(impossible event) = 0. So UCF has made up their own criteria, which doesn’t affect the truth of the “College Football Playoff Championship” one iota. Saban is being annoyed and pompous at best, and insecure at worst. Again, I don’t think he or anybody else should be concerned that UCF claims themselves NC, because it obviously is not real or recorded as such. No one needs to speak to it. The more people speak to it, the more credence it gets. That’s why UCF is doing it. I hope every non-power 5 “champion” from here to eternity does the same thing until change is made.